Start with the basics, then make a few simple modifications, to change what was traditional into modern! A 4-patch block—a simple, yet elegant patchwork design—has such potential! 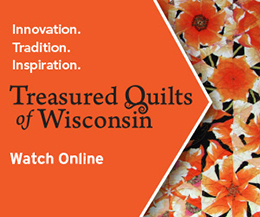 Presto, you’re a quilt designer, creating one-of-a-kind designs. Welcome to Sewing With Nancy’s first episode of the three-part series, Change-Up Patchwork. A 3-color 4-patch serves as the basis for this blog and corresponding TV show. Begin your change-up patchwork journey with a traditional 4-patch. Mix up the line-up using three different sizes of 4-patches for 4″, 8″, and 16″ finished quilt blocks. The various sizes of 4-patch blocks are cleverly combined with solid blocks to create a modern small-to-large block theme. It’s a can-do quilt! Learn how to create rows of 4-patch blocks and squares. The different sizes of the 4-patch blocks nest together! The beauty of this quilt is its simplicity! Tweak the sizes of the 4-patch strips and the patchwork design to give the illusion of movement when four blocks are combined. Use bold, bright batik fabrics or your fabric print/solid combination. Remember, you’re the quilt designer. The TV show and book detail how to change the sizes of the strips. Featured is a 4-patch design, an uneven 4-patch. The block by itself doesn’t look like much . . .
but arrange four of the same blocks together—presto, a Spinning 4-Patch! A block that is usually symmetrical takes on a totally different feel when what was balanced becomes uneven. Don’t change the sewing steps, only the strip sizes. Can you see the strata sections? Watch the show online and you’ll get all the details! It’s an ideal block for a table runner. Find these easy 4-patch quilts, and six additional quilts, in the Change-Up Patchwork Book. Watch Change-Up Patchwork on Sewing With Nancy online. Nancy’s Notions is giving away one copy of the book, Change-Up Patchwork. Leave a comment below to enter the giveaway, telling us which of these designs you’d like to make. The randomly selected winner of a copy of the Doodle Stitching Book, from Nancy’s Notions, is Linda, from the June 28 post. Her comment is: The scarf created with sheer layers is beautiful—I have never doodle-stitched on sheer fabric and need to give that a try. I love the fact that with doodle-stitching there really is no wrong—thank you, Nancy, for your legacy of wonderful tips and techniques! Love the HighLow 4 Parch design and beautiful restful color combination.. These 4-patch block patterns would be great for the 4-H kids that I help sew quilts. They would be easy, yet look like they are complicated to make. I think the kids would love these patterns. I love the Can Do Four Patch. Always looking for a new design. The book looks enticing!!!! The four patch is such a basic unit in patchwork quilting — it is inspirational to see different ways to use it — so much fun! I’d love a copy of the book. Nancy had an incredible gift, always able to make quilting seem easy and enjoyable. Her directions are spot on, and she just made it fun! I love volunteering at Quilt Expo, and was able to meet her once. Her happy spirit was contagious! I’ve made two of the 7 patch weave quilts. One was a queen sized bed quilt, and the other was a throw sized quilt. I machine quilted the small one with quilting motifs in my Baby lock Destiny. It tuned out beautifully, and I am anxious to embroider-quilt another one soon. I love the Scrappy Squares quilt. it is always in the back of my mind and, someday, I will put other projects aside and make it. I would love to win the book. I like the spinning 4-patch. Bright colors, like the one pictured, would be great as a quilt for charity. I like both the high low and the spinning 4 patch blocks -can see using this book a great deal. I lead a church quilt group and we make quilts for several various groups in need of quilts. I try to pick quick and easy patterns but yet ones that can be made really interesting for children in hospitals or folks going through chemo treatments. Thanks for the opportunity to win this book but have a feel I will add it to my collection even if I don’t win it. I really like the spinning 4 patch. I can see using this book quite a bit. I am part of a guild that makes quilts for our local hospital’s NICU as well as charity quilts. Our fabric consists of what is donated so I can see how these blocks would work very well with that. Also I can see making a table runner out of the high low block and I have just the fabric to use for it. I love the simplicity of the blocks creating such diverse looks for different quilts. Would need to choose which one to start with…..probably the high low or can do. Thank you for continuing and the opportunity! I really like the high low 4 patch! I have 10 grandchildren. Only one of them is interested in vintage type quilts. The rest want to have more modern designs. With the quilt patterns in this book I will be able to satisfy all and make quilts they all will enjoy. Thank you for the opportunity. I am still heartbroken about Nancy’s death, making these quilts will also open the door for me to tell this generation about Nancy. My choice would be the high-low 4 patch used as a table runner. I like the high-low 4 patch used as a table runner. I love the spinning four patch and would like to make a baby quilt for my niece with that pattern. The next one I would like to try is the high low one. I think that although they are easy they create stunning quilts. Thank you Nancy for sharing your wisdom all these years and to your team for keeping your legacy going. I have always liked the pink & black spinning patchwork. Stunning!!! Also like the other variations for such a traditional block. I love the Can Do pattern. It just looks fun. Thank you. High-Low 4 Patch is a perfect design for a challenge quilt I need to make (the large square will be for the feature fabric which all participants are required to use). I love the High-Low as a possible pattern for older kids in hospitals. It is usually easy to find patterns for little ones, but more challenging to find appropriate patterns for older teens…especially boys. Great patterns all around. Thank you for the opportunity to win the book, but also for Nancy’s great videos. What a versatile block! I would love to make the High-Low 4-Patch Table Runner in different color combinations for each season. Thanks for the great giveaway. I like the spinning 4 patch. It would be fun to make. I love the math of this quilt – May try in in scraps! I love the uneven 4 patch. Oh the colors you could use. Always nice to learn ways to make the simple work in different and interesting ways. Thank you. Love the four patch and all the changes you can create with it! Love to make a Spinning 4 Patch quilt!!!!! I would love to try all the patterns. We have a group from our Church that make many quilts for charity. The patterns from this book would make beautiful quilts for our group to make. I love the High/Low 4 patch. It could be done in so many colorways. I even think fussy cut motifs interspersed within the quilt could make it a fun baby quilt. The high-low 4 patch is eye-catching and I would choose that design as a starter. I lie the can do, 4 patch. I would stick with the 8 inch square and make a cute heart quilt! ‘Can Do 4 Patch’!!!! Love how it plays tricks with your eyes!!!! Very cool!!!!!! I would make the first one that uses three different sizes of four patches. I really like how it looks. Thank you for all the marvelous quilt you show, teach and encourage us to try. I would start with the High Low 4 patch. I think I would make the High-Low 4-patch. It looks simple to make. I am a member of the Old Town Quilt guild and we have been making table runners to sale at the storytelling festival in Jonesborough TN in October. The money raised will go to the local food bank. My quilting journey began many moons ago with the nine patch block. I think it is time for me to revisit this favorite block using this change-up strategy. it should be lots of fun! The spinning four patch is calling me! I watched this series on TV, as well. I have my eye on the 7-Patch Weave. I love the simplicity of that design, yet I can imagine turning it into a trellis, adding florals in place of some of the plain, white squares! Applique a few vines and extra flowers, here and there, and Wow! Oh, I am SO going to make this Can-Do quilt! I am seeing all sort of color combinations on this baby. (Drool) . Although I do own several, I would love to have an entire collection of Nancy’s books and videos. The pink, black and white is so dramatic. On my “to do” list. The CAN DO FOUR PATCH looks like a pattern that would please my teenage grandson. It looks challenging but fun to do. I’d like to do the Can Do 4 Patch. I would like to give the Can-Do 4 patch a try. I love the high low four patch. I would love to experiment with other color themes. The spinning 4-patch is really interesting and fresh, but the high-low block is the one that makes me want to start a new project. I really like the surprises I see in the can do 4 patch. Such small changes, with big results! I’d like to make the Can Do 4 patch quilt first. It’s so striking. But I do love the others as well. I want to try all of them! I’ve got a bunch of batiks I want to try with the spinning one, other fabric to try for the others. I love the fact that it is possible to get such different looks from such a simple block, so great for comfort quilts and for teaching beginners. Would love to have designs like this to up the number of quilts I can make. Thanks to Nancy for making these ideas available and for making it seem so easy. No fear in attempting these designs. Easy assembly and great results with little frustration. I would love to have this book. I saw Nancy demo it on TV a while back and made a note of it then. Sometimes I just need a quick idea for my baby quilts and these patterns are perfect. I really like the spinning 4 patch. I make a lot of donation quilts, and this pattern would be a very good one for that purpose. I like the high-low and the Can Do 4-patch. Think these would work up fairly fast and be fun for some of the kids. Would sure like to have this book. I really love the scattered squares! I would love to make a quilt for our daughters bed with music fabric with that pattern! - I have begun a couple of designs of my own from the giant Lone Star temples and the Dresden templates. Nancy’s methods make things so easy! Thank you again for many wonderful ideas! So many quilt patterns, so little time! I think I’ll start with the spinning three patch. The “Can do” 4 patch has such energy and fun with it. I think I would start with that one. The spinning 4 patch is a close second though. Thanks for another fun contest. I like the high-low 4-patch. Love the spinning 4 patch. I can think of so many ways to make this pattern that would have a different “feel”. Black and white and bright would feel elegant. A selection of brights would make a great child’s quilt. All the quilts are good. Wouldn’t know which one to make first. Thanks for the chance to win. There are some wonderful ideas in this book, and I would love to try some of them out. I love the table runner and will put it on my list of items to make. It looks so modern but easy to sew. I like the first design – the design possibilities seem endless. I am intrigued with optical illusion designs and hope to make a quilt like this soon. I love the look of the high low four patch. The color choice is very appealing also. This is so Nancy !!!! She had such an amazing ability to take the complicated and make it easy so everyone can do it!!! She was so talented and personable. The quilts look wonky and just plain fun!!! I would be so excited to do these quilts!! I would love to make the CAN DO FOUR PATCH . It looks so hard but I bet with your pattern it will be so easy. I enjoy making quilt tops. The idea of changing block sizes colors and arranging them to create a different quilt pattern has inspired me to continue to make lap size quilts for hospice patients.